Integrating your calendar with PracticePanther. Below you will find a start to finish tutorial covering everything you will need to know regarding the calendar integrations in PracticePanther. Jump to the topic of interest by clicking on a title in the index below. 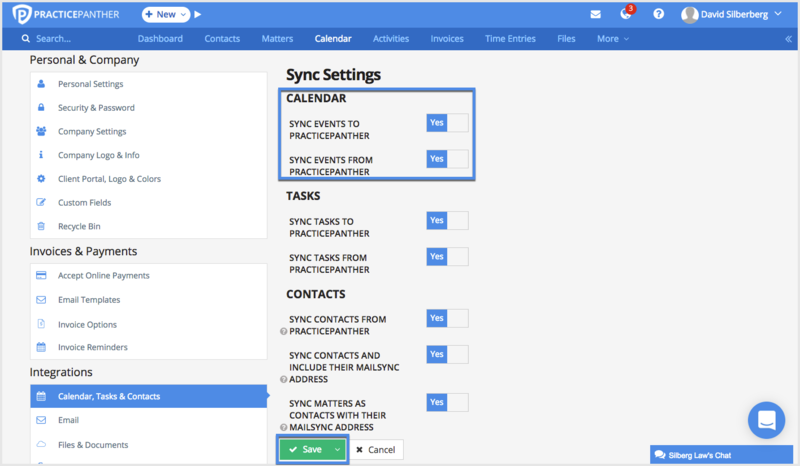 1) How do I sync my Google Calendar? Navigate to the Settings > Calendar, Tasks and Contacts. 2) Select Activate Sync, from the Google option. 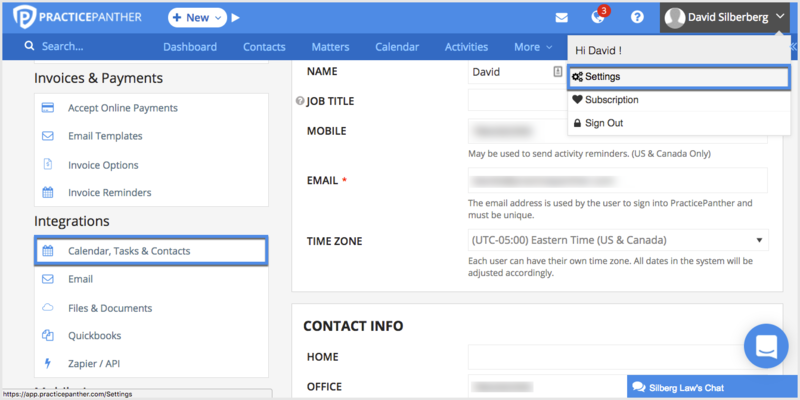 4) This page allows you to sync your Calendar, Tasks, and Contacts to Google. Make sure the event settings are marked "Yes" for the sync to work. What happens after you sync the calendars? *Important* This is the only calendar in Google that is talking with PracticePanther.com. Events from PracticePanther.com will appear on this calendar, and events on this calendar will get pushed to PracticePanther.com. In yellow (this color may vary), we can see the event that was synced from PracticePanther.com. If you want a new event in Google to get synced with PracticePanther, simply select the "PracticePanther" calendar before saving the event. New events made in Google may take up to an hour to appear in PracticePanther. 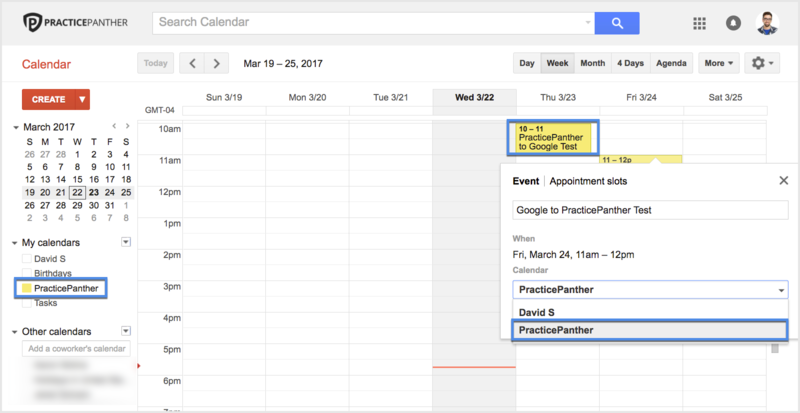 Can a user have their own color-coded events in the Google PracticePanther Calendar? Each user will sync their own Google Calendar with PracticePanther. They will then see events in their Google Calendar called PracticePanther that are assigned to them. 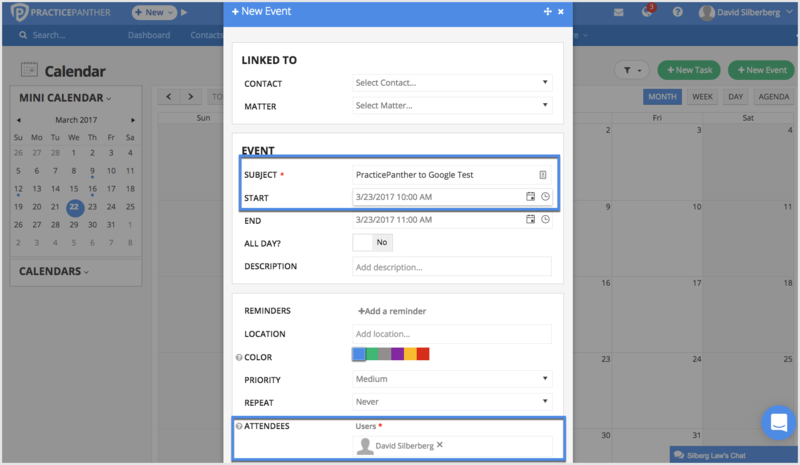 Google Calendar users can share calendars with each other. So the solution will be to have each user share their PracticePanther calendar with the other users. This will allow the other users to see everyone else's PracticePanther calendar in a different color and can toggle it on/off. Instructions are here under "Share existing calendar", to make things easier, they can create a group and select "Share with a group" so there won't be a need to do it with individuals users. IMPORTANT: Users can't rename their own PracticePanther calendar as we use the calendar name to sync the events. 1) Copy the unique link found on that page. 5) In the "Calendar URL" box, paste your unique calendar link from this page. 6) Enter a name for the calendar and choose a color. 7) If you like, select a charm that will appear in every day that new events occur. 8) Click the purple "Subscribe" button. 2) Copy and paste your unique calendar link from this page, and then click "Subscribe". 3) Enter a name for the calendar in the "Name" field and choose a color from the adjacent pop-up menu. 4) Click "OK" when you're satisfied with your settings. 5) To make changes to the calendar, click the name of the calendar, and then choose Edit > Get Info. Wait 3-5 minutes while the calendars connect. 4) Open up your Outlook calendar, and under "My Calendar", you should see the "PracticePanther" calendar. Anything you schedule in the PracticePanther calendar in Outlook will sync with the PracticePanther app, and vice versa. Events made here take up to 30 minutes to copy in to the PracticePanther app. Events made in the PracticePanther app move to Outlook immediately.